Blasting is the operation of shooting a stream of abrasive material against a metal surface under high pressure to smooth a rough surface, roughen a smooth surface, or remove rust or old paint. This step creates the ideal bonding environment for powder coating or paint finishes. Blasting removes any mill scale, rust, or existing coating. This helps prepare steel or galvanized metal for good adhesion. We have an 80′ x 40′ outdoor blast bay as well as a completely indoor blast bay with multiple medias. There are several types of blasting, some are highly abrasive such as metal grit and sand blasting, while others are more mild such as aluminum oxide blasting. 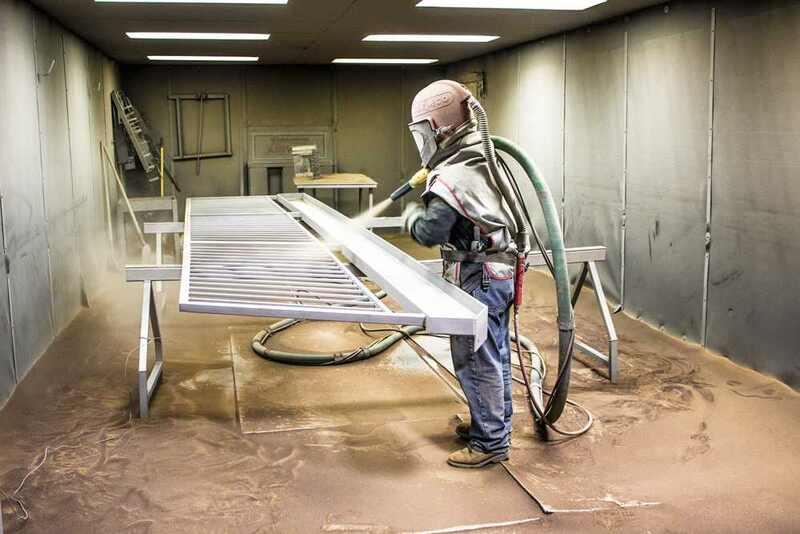 We offer sand blasting, metal grit blasting, glass bead blasting, and aluminum oxide blasting. We will work with you to decide which process will best suit your needs for your project.